The University of California system intends to become carbon neutral by 2025, and UCSB took another step forward that could affect transportation along South County. The school will be adding 1,200 ride-share bicycles to the hordes that already stream through campus when classes are in session. And the selection process included conversations with the county and city of Santa Barbara and Goleta, all of which are interested in the ride-share concept, one of them with serious trepidation. 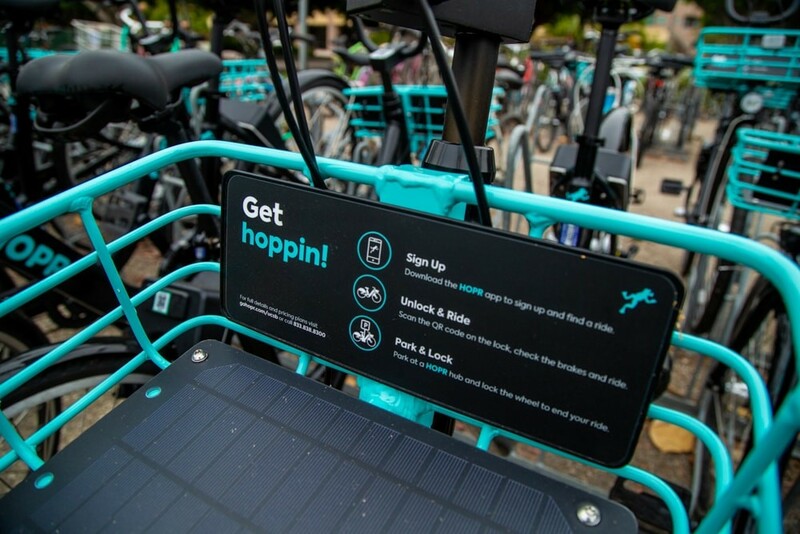 UCSB signed a three-year contract with CycleHop, which rolled 300 of its black-and-teal HOPR pedal bikes onto campus and into Isla Vista on August 31. Theoretically, the bikes are “dockless,” or are rentable via smartphone and then can be left anywhere. But HOPR marketing director Chelsea Davidoff explained that riders are told to return their ride to so-called “parking ponds” scattered around campus and Isla Vista. Bike renters are rewarded for returning bikes to ponds and penalized when they don’t. The county has permitted about a dozen bicycle-parking stations in Isla Vista, taking the view that cheap bike transportation is “one less car in an extremely congested area,” said Matt Dobberteen, the county’s alt-tranportation chief. Dockless scooters met a swift end in Santa Barbara this June when Lime parked 100 electric ones without a permit on State Street, and city crews immediately impounded them. The scooters have proved notorious in towns like Venice and San Francisco for being abandoned in inconvenient spots; people took revenge by trashing them or even setting them afire. L.A. Metro’s ride-share bicycles in Pasadena just died an early death, the Los Angeles Times reported on Monday, after only 14 months of operation. Ridership was sometimes once a day for the 375 bicycles, which cost riders $3.50 per trip. Pasadena also paid $100,000 a month to Metro for the program, which competed with companies like CycleHop in West L.A.
At UCSB, CycleHop is shouldering the cost of the bikes, the tech, and the pickup and distribution of randomly parked bicycles daily. Rides are a dollar for 30 minutes, $10 per month and 60 minutes per day, or $60 per year and 90 minutes per day, and the annual fee comes at half price for 1,000 financially qualified Gauchos. HOPR’s customer service can unlock a bike and return it for those without a smartphone. And with an annual pass, a low-priced battery pack is available for HOPR’s electric-and-pedal version, about half the fleet by January 2019, that runs about 10 miles. The bike-share program adds to UCSB’s Carbon Neutrality programs, which include water recycling, solar power, energy-efficient building, electric transportation, and a goal of zero waste. 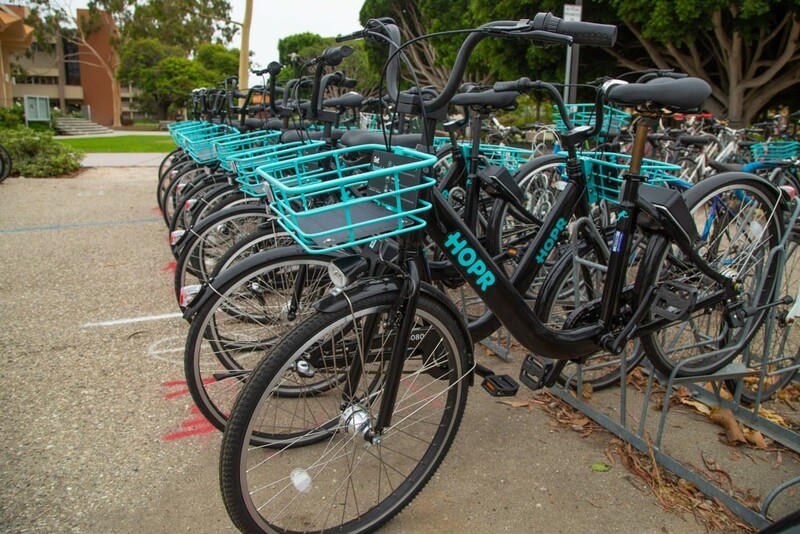 The City of Goleta is most engaged with HOPR, which is working with the city’s green committee, said Valerie Cantella, city spokesperson, to bring the bikes to town and its Amtrak station for commuters. Though the new morning train is subsidized by $2.5 million from the Santa Barbara County Association of Governments (SBCAG), ride-share bicycles are not part of SBCAG’s picture, said Transit Manager Scott Spaulding. The City of Santa Barbara, leery from the Lime scooter fiasco, plans to carefully craft an ordinance, said Sam Furtner, the city’s mobility coordinator, to contain the potential plague of dockless bicycles before permitting them at the downtown Amtrak station. UCSB’s rollout and Isla Vista’s response is a test case, he said, and the city is looking at serious permit standards, such as San Francisco’s nine-page permit.